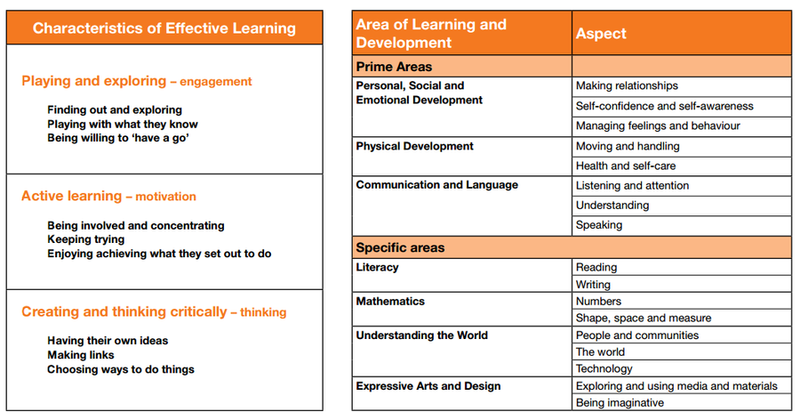 We use the characteristics of effective learning as a vehicle to deliver the areas of development laid out in the Early Years Foundation Stage (EYFS). The curriculum is delivered through continual provision and small group activities designed to specifically target key areas of learning. Our environment is specifically set up to provide children with access to a range of free choice learning opportunities which are initiated from their individual interests. We always ensure children have time to explore a range of aspects of learning and development: mark making (early writing); maths; creative; reading; communication; social interaction to name a few. Whilst children have free choice of activities, highly trained staff will intervene when needed to move learning forward. Key learning points are modelled in circle time or scaffolded through group work or with individuals. We have a key person system where staff are allocated focus children and parents to foster strong relationships with, to assist their transition. This system ensures your child’s learning is maximised through close observation and achievable targets. We have the luxury of having weekly access to the most spectacular forest school area which includes a crooked tree house, a mineshaft and a fire circle. Under close supervision, we also have access to a wild meadow and a newly developed pond area teaming with wildlife to explore. On Friday morning, we pop on our wellington boots and build shelters for animals, hunt for mini-beasts, and investigate mud, twigs, trees and so much more. Our outdoor classroom and specialist clothing means we can go outdoors whatever the weather. We have two trained Forest School leaders on site which encourage children to take safe risks, using tools and equipment to broaden their experiences. The forest is an ideal place for children to further develop both their physical and social development and their understanding of the world around them. On top of this, it is simply tremendous fun!